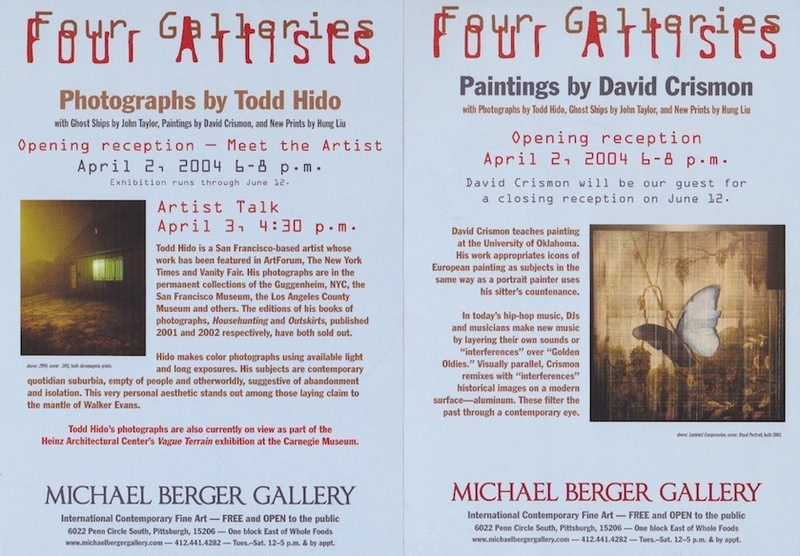 David Crimson teaches painting at the University of Oklahoma. His work appropriates icons of European painting as subjects in the same way as a portrait painter uses his sitter's countenance. In today's hip-hop music, DJs and musicians make new music by layering their own sounds or 'interferences" historical images on a modern surface--aluminum. These filter the past through a contemporary eye. Hung Liu's paintings and prints often make use of anonymous Chinese historical photographs, particularly those of women, children, refugees, and soldiers as subject matter. Liu's paintings - often large, drippy, and washed with layers of linseed oil - can be seen as critiques of the rigid academicism of the Chinese Socialist Realist style in which she was trained, as well as metaphors for the loss of historical memory. One of the first Chinese artists to study in the U.S., Liu's works represent the ongoing tension between emigration and immigration. Liu has received numerous awards, including two painting fellowships from the National Endowment for the Arts, and her work is represented in the permanent collections of major museums and private collections throughout the United States and Asia. Todd Hido is a San Francisco-based artists whose work has been featured in ArtForum, The New York TImes and Vanity Fair. His photographs are in the permanent collections of the Guggenheim, NYC, the San Francisco Museum, the Los Angeles County Museum and others. The editions of his books of photographs, Househunting and Outskirts, published 2001 and 2002 respectively, have both sold out. Hido makes color photographs using available light and long exposures. His subjects are contemporary quotidian suburbia, empty of people and otherwordly, suggestive of abandonment and isolation. This very personal aesthetic stands out among those laying claim to the mantle of Walker Evans. John Taylor is a landscape architect by trade, who stumbled into a world of ship-making on a miniature scale by accident. He uses ocean and river vessels as the medium of expression, incorporating a love of found objects, technology castoffs, and vintage materials. Taylor has produced over 250 pieces, been recognized in numerous articles and exhibits, and served as a speaker and visiting artist at museums and universities. His work is now in several prestigious collections.